At least they are doing something right with the kids: they get to school on bikes. 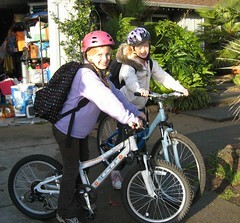 Originated in Marin in 2000, Safe Routes to School has an active and well-funded program in Marin County. Now a national organization with government funding, Safe Routes to School runs programs in many states. Even here in Washington. My friend’s 8 and 10-year-old daughters ride their bikes to school every day on their own, nary a parent in sight. They live less than two miles from school and their route winds through calm neighborhood roads. The school and family only has a few rules for biking to school without parents: the kids must be in 3rd grade and they always ride with a buddy. The morning I was there, the girls each received calls from their friends asking them to pick them up on the way to school. It’s fun to ride to school with friends. 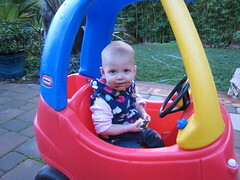 Soon their little sister will exchange her car for a bike and join them! Do you know kids who ride or walk to school on their own? What’s a good age for biking to school without parents? This entry was posted in alternative transportation, bikes, In other Cities, kids, neighborhoods, School and tagged bike-to-school, kids, Marin, Safe Routes to School. Bookmark the permalink. I think 3rd grade is a good age for kids to ride on their own (at least to a neighborhood school). It certainly depends on the kid’s personality and their ability to make smart decisions. Parents worried a lot less when we were kids. Our generation of parents seem to hover more for what ever reason. I would say fourth grade is when most children would be able to ride by themselves to school. Of course, there are plenty of responsible third graders that could easily do it as well. In the Netherlands and Germany, all children receive traffic education, including bicycling, by age 10. Sounds good though I am a little puzzled why the school should be allowed to put any restrictions on what transport the children use to get to school. It should not be any of their concern (beyond providing adequate parking and lockers, which of course they should provide). In America, we love to make rules and legislate. A product of our litigious society – you never know who is going to sue. Schools are just protecting themselves, I guess.